Closed fly on a pair of jeans. The topstitching on a fly will often, as here, be bar tacked. A fly on clothing is a covering over an opening concealing the mechanism, such as a zip, velcro, or buttons, used to close the opening. 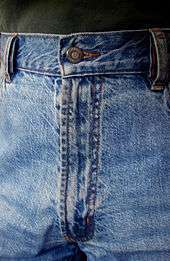 The term is most frequently applied to a short opening over the groin in trousers, shorts, and other garments. 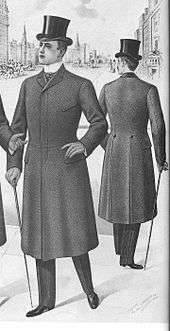 The term is also used of overcoats, where a design of the same shape is used to hide a row of buttons. This style is common on a wide range of coats, from single-breasted Chesterfields to covert coats. This article is issued from Wikipedia - version of the 4/17/2016. The text is available under the Creative Commons Attribution/Share Alike but additional terms may apply for the media files.